From world-renowned fine art collections to heart-pounding roller coasters to world-class dining, no city offers more variety than Las Vegas. Check out the photo gallery for some of Las Vegas's can't-miss attractions. Ethics, always a hot topic in the anti-fraud industry, is in the forefront of many CFEs mind these days. 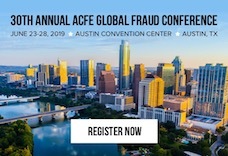 So much so that the ACFE Global Fraud Conference devotes an entire track to legal and ethical issues. In this preview of the Ethics Panel, ​moderator Michelle Brown, CFE shares her view on what makes ethics such a hot topic right now and what attendees can expect to take away from the session.